Posted by alwaysjan in Art Education. Black construction paper. White glue. Chalk. It’s that easy. (Okay, I used pastels instead of chalk, which aren’t that cheap, but you can get a lot of mileage out of a couple of boxes). I’d seen the fantastic artwork done by second graders displayed in the hall using this process. That art was simpler – a straight line, a curvy line, and a zigzag line, with the shapes colored in between. Wonderfully abstract images. Some of my third graders had already “been there, done that,” so I upped the ante. Since we’ve studying fractions, I had them fold their paper into fourths. (I’m big on killing one bird with two stones -better yet, pummel that bird with as many standards (er, I mean stones) as you can lay your hands on. The directions were to draw a geometric shape (a triangle) in 1/4, an organic design in 1/4, and a spiral in 1/4. The last quarter was free choice (that always elicits a cheer). No drawing in pencil first either. I drew a couple of examples on the board then turned my students loose. The biggest problem was even though I’d checked the Elmer’s glue bottles, half of them were clogged. I spent a fair amount of time bending paperclips to try and get the glue flowing. Note to self. Next time, have a student test all of the bottles ahead of time! A few students were a little heavy-handed when it came to squeezing the glue, but overall it went quite smoothly. I showed students how to carry their papers over to the floor like a tray of cookies, or else the glue would start running. I hoped that if we laid the papers in front of my big fan, the glue might dry while we were at lunch. Wishful thinking. This is a 2-day project. I cordoned off the “drying” area with rope. One student remarked it was like having an art gallery in our classroom. The children proceeded to crowd the rope to get a better view of their art. Yes, it did look like a gallery – on the floor and laid out over several chairs. When one boy decided he was going to be the museum “guard,” I sent them all back to their seats. By the next day, the white glue had dried so that it was clear. I gave a quick lesson in how to use the pastels. Don’t use them like crayons; use the sides. Each table got a paper plate of various colors and I suggested they complete 1/4 then walk around to see what other students were doing. There’s always a couple of “Class Artists” who are only to happy to share their expertise. Trouble Shooting: 1) There’s always those kids who just use the same old colors on the school rug-red, blue, yellow, and green. I suggested they experiment with blending colors or working with only cool colors and then using one warm color. 2) A couple of kids paid no attention to the raised glue lines. They just wanted to color in big areas and viewed the lines as “speed bumps.” I had to get them to slow down and work within the lines. Considering it was the first time I taught the lesson, I thought the results were stunning. When the pastel goes over the glue, it takes on almost a metallic or jewel-tone look. Ooooh! Ahhhhh! I’m going to go out on a limb here and say the dreaded words. Drill and kill. Yes, you heard me right. Drill and kill. Unlike a certain vice-presidential candidate, I’m not talking about the solution to end our dependence on foreign oil, or my weekend plans to pick off wildlife with a high-powered rifle from low-flying aircraft. No, what I have in the cross hairs of my scope is a more elusive target – multiplication. Third grade is the beachhead for mastering multiplication. Students who are promoted to fourth grade and haven’t memorized their times tables should prepare to hunker down in the trenches of “And would you like fries with that?” Study after study has shown that the majority of students who struggle with math in middle and high school never learned their multiplication facts. I attended a week-long math training last summer and the trainer taught all sorts of alternatives to the dreaded drill and kill technique. She demonstrated ways to calculate facts by contorting your hands and fingers so that you ultimately came up with the answer, while also getting a vigorous physical workout. These alternatives fell somewhere between throwing up gang signs and cheerleading. Hello? 3×7 is 21! I knew that, and I didn’t even have to slap my thighs and yodel the answer! Some people call it drill and kill, but my students call it FUN! They literally salivate at the chance to practice math facts. It wasn’t always like that. Five years ago I attended a New Management Seminar given by Rick Morris, who has lots of creative ideas on classroom management. That’s where I learned about the TeachTimer, which can be used on any standard overhead projector. It functions as a clock and a timer, and can count up or down. It costs around $40 (divide by $3.75 to calculate the number of lattes this equals). I’ve only had to replace the battery once, which makes it one of the best investments I’ve made. Here’s how I do it. My friend, Jen, gave me sheets of 100 math facts – various levels of addition, subtraction, multiplication, and division. My students drill daily and by introducing the timer on Day 1, they get over their fear of being timed. And here’s the best part. The students correct it them themselves! Those who’ve finished the row raise their hands and I call on one. “Einstein, Row A,” and Einstein ticks off the answers. Row B! Row C! Most of my students are ELLs (English Language Learners), so this also gives them the opportunity to speak. 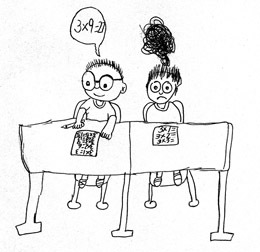 Most ELLs are more comfortable with math and saying numbers aloud. At the beginning of the year, I have students practice reading the answers at just the right pace, and how to project their voice. If someone gives a wrong answer, there’s an incredulous chorus of “Huhs?” and the mistake is rectified. Students put a tick mark next to each correct answer (no stars!) as they correct. If they get an answer wrong, they just circle it, as there’s no time to write the correct answer. After practicing last year, we timed ourselves. It took SEVEN MINUTES to do a five-minute drill AND correct it! Last Friday I put one of my students in charge of correcting. He called on students and they rattled off the answers. This gave me TWO WHOLE MINUTES to do something productive like figure out where I’d put my brain. Do you know how many teachers would kill for just two extra minutes? It was bliss, and the kids were totally running the show. The drawing above was done by one of my students who was a crackerjack reader, but was flirting with early arthritis from chronic finger counting. He drew the picture at the end of the year after his confidence had soared 100 times (and yes, he could calculate x 100 using that neato zero trick). Drill and kill? Just ask my students. They’ll tell you multiplication rocks! The entire school year I’ve tested my students ad nauseam, so what do we do on that last day of school? We test! But this test, aka “The Screwball Games,” gives kids the opportunity to show off those all important skills and talents that standardized testing overlooks. Skills such as the vastly under rated ability to cross your eyes, which sadly I am unable to do. So each June I’m humbled by these children who only come up to my armpits, yet can cross their eyes, do the splits AND wiggle their ears. Students work in small groups and are so eager to participate in this freak show, they actually work cooperatively! But as the teacher, you must set clear standards for each skill so it can be accurately assessed. For example, staring intently at your nose is NOT crossing your eyes. The “Screwball Games” also provide the opportunity for students to demonstrate overlooked talents, so truly NO child is left behind. One year four boys came to the front of the class and belched an entire song. That’s got to meet some Listening and Speaking Standard! Because it’s the last day of school, don’t waste your time on such mundane skills as cartwheels, armpit farts, or being able to do the crab walk. Encourage kids to go for the gold! You’d be amazed how many kids can flip their eyelids inside out, or pop entire portions of their bodies out of joint. Talk about multiple intelligences! Put one foot behind their head? Two feet? Give students about 20 minutes to meet with their groups so they can each demonstrate their special abilities to the other group members. Have one person write down the names of those who can. Then have students return to their seats and name a category. All of the ones who can do it come up front and demonstrate at the same time. The effect is fantastic! When all of the them are hopping on one leg while you man the timer, it’s like watching a deranged performance of “River Dance.” One year I had three students who managed to get their foot behind their head, but failed miserably at getting it out from behind their it. This required a calm demeanor to extricate them from this rather embarrassing predicament. Note: Tell the girls ahead of time to wear pants. The “Screwball Games’ provides a good hour’s worth of hilarity, and more importantly, the chance for you to sit back and be entertained. So let the games begin!